A trailer is an unpowered vehicle towed by a powered vehicle. It is commonly used for the transport of goods and materials. 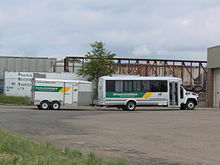 Sometimes recreational vehicles, travel trailers, or mobile homes with limited living facilities where people can camp or stay have been referred to as trailers. In earlier days, many such vehicles were towable trailers. In the United States, the term is sometimes used interchangeably with travel trailer and mobile home, varieties of trailers and manufactured housing designed for human habitation. Their origins lay in utility trailers built in a similar fashion to horse-drawn wagons. A trailer park is an area where mobile homes are placed for habitation. 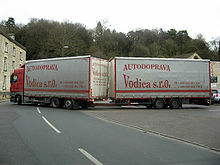 In the United States trailers ranging in size from single-axle dollies to 6-axle, 13-foot-6-inch (4.11 m) high, 53-foot (16 m) long semi-trailers are commonplace. The latter, when towed as part of a tractor-trailer or "18-wheeler", carries a large percentage of the freight that travels over land in North America. Some trailers are made for personal (or small business) use with practically any powered vehicle having an appropriate hitch, but some trailers are part of large trucks called semi-trailer trucks for transportation of cargo. Enclosed toy trailers and motorcycle trailers can be towed by commonly accessible pickup truck or van, which generally require no special permit beyond a regular driver's license. Specialized trailers like open-air motorcycle trailers, bicycle trailers are much smaller, accessible to small automobiles, as are some simple trailers, pulled by a drawbar and riding on a single set of axles. Other trailers, such as utility trailers and travel trailers or campers come in single and multiple axle varieties, to allow for varying sizes of tow vehicles. There also exist highly specialized trailers, such as genset trailers, pusher trailers and their ilk that are also used to power the towing vehicle. Others are custom-built to hold entire kitchens and other specialized equipment used by carnival vendors. 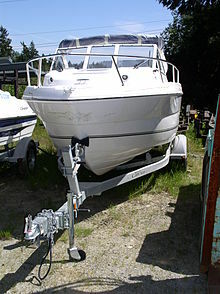 There are also trailers for hauling boats. Popular campers use lightweight trailers, aerodynamic trailers that can be towed by a small car, such as the BMW Air Camper. 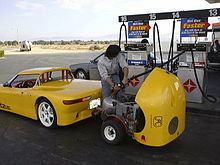 They are built to be lower than the tow vehicle, minimizing drag. Others range from two-axle campers that can be pulled by most mid-sized pickups to trailers that are as long as the host country's law allows for drivers without special permits. Larger campers tend to be fully integrated recreational vehicles, which often are used to tow single-axle dolly trailers to allow the users to bring small cars on their travels. A semi-trailer is a trailer without a front axle. A large proportion of its weight is supported either by a road tractor or by a detachable front axle assembly known as a dolly. A semi-trailer is normally equipped with legs, called "landing gear", which can be lowered to support it when it is uncoupled. In the United States, a single trailer cannot exceed a length of 57 ft 0 in (17.37 m) on interstate highways (unless a special permit is granted), although it is possible to link two smaller trailers together to a maximum length of 63 ft 0 in (19.20 m). Semi-trailers vary considerably in design, ranging from open-topped grain haulers through Tautliners to normal-looking but refrigerated 13 ft 6 in (4.11 m) x 53 ft 0 in (16.15 m) enclosures ("reefers"). Many semi-trailers are part of semi-trailer trucks. Other types of semi-trailers include dry vans, flatbeds and chassis. Many commercial organizations choose to rent or lease semi-trailer equipment rather than own their own semi-trailers, to free up capital and to keep trailer debt from appearing on their balance sheet. A full trailer is a term used in the United States for a freight trailer supported by front and rear axles and pulled by a drawbar. In Europe this is known as an A-frame drawbar trailer. A commercial friegt trailer is 96 or 102 in (2.44 or 2.59 m) wide and 35 or 40 ft (10.67 or 12.19 m) long. As per AIS 053, full trailer is a towed vehicle having at least two axles, and equipped with a towing device which can move vertically in relation to the trailer and controls the direction of the front axle(s), but which transmits no significant static load to the towing vehicle. 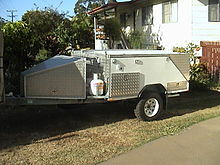 This style of trailer is also popular for use with farm tractors. A close-coupled trailer is fitted with a rigid towbar which projects from its front and hooks onto a hook on the tractor. It does not pivot as a drawbar does. A motorcycle trailer may be a trailer designed to haul motorcycles behind an automobile or truck. Such trailers may be open or enclosed, ranging in size from trailers capable of carrying several motorcycles or only one. They may be designed specifically to carry motorcycles, with ramps and tie-downs, or may be a utility trailer adapted permanently or occasionally to haul one or more motorcycles. Another type of motorcycle trailer is a wheeled frame with a hitch system designed for transporting cargo by motorcycle. Motorcycle trailers are often narrow and styled to match the appearance of the motorcycle they are intended to be towed behind. There are two-wheeled versions and single-wheeled versions. Single-wheeled trailers, such as the Unigo or Pav 40/41, are designed to allow the bike to have all the normal flexibility of a motorcycle, usually using a universal joint to enable the trailer to lean and turn with the motorcycle. No motorcycle manufacturer recommends that its motorcycles be used to tow a trailer because it creates additional safety hazards for motorcyclists. There is a number of different styles of trailers used to haul livestock such as cattle and horses. 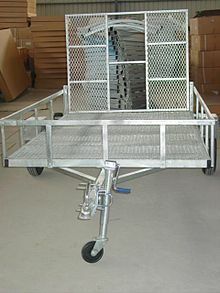 The most common is the stock trailer, a trailer that is enclosed on the bottom, but has openings at approximately the eye level of the animals to allow ventilation. The horse trailer is a more elaborate form of stock trailer. Because horses are usually hauled for the purpose of competition or work, where they must be in peak physical condition, horse trailers are designed for the comfort and safety of the animals. They usually have adjustable vents and windows as well as suspension designed to provide a smooth ride and less stress on the animals. In addition, horse trailers have internal partitions that assist the animal in staying upright during travel and protect horses from injuring each other in transit. Larger horse trailers may incorporate additional storage areas for horse tack and may even include elaborate living quarters with sleeping areas, bathroom and cooking facilities, and other comforts. Both stock trailers and horse trailers range in size from small units capable of holding one to three animals, able to be pulled by a pickup truck or even an SUV; to large semi-trailers that can haul a significant number of animals. A trailer hitch, fifth-wheel coupling or other type of tow hitch is needed to draw a trailer with a car, truck or other traction engine. 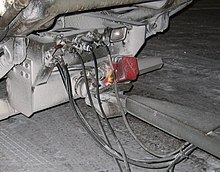 A trailer coupler is used to secure the trailer to the towing vehicle. The trailer coupler attaches to the trailer ball. This forms a ball and socket connection to allow for relative movement between the towing vehicle and trailer while towing over uneven road surfaces. The trailer ball is mounted to the rear bumper or to a draw bar, which may be removable. The draw bar is secured to the trailer hitch by inserting it into the hitch receiver and pinning it. The three most common types of couplers are straight couplers, A-frame couplers, and adjustable couplers. Bumper-pull hitches and draw bars can exert tremendous leverage on the tow vehicle making it harder to recover from a swerving situation. These are available for loads between 10,000 and 30,000 pounds (4.5 and 13.6 t). Both the hitches are better than a receiver hitch and allow a more efficient and central attachment of a large trailer to the tow vehicle. These hitch types are designed for pickup truck bed. They are able to haul large loads without disrupting the stability of the vehicle. Traditional hitches are connected to the vehicle back but these are attached to the truck bed, which make them better for making sharp turns and cutting tight corners. Both styles have trailers attach to a coupler mounted above the axle within the bed of the tow vehicle such as a flat deck or pickup truck. A fifth-wheel coupling is also referred to as a kingpin hitch and is a smaller version of the semi-trailer "fifth wheel". Though a fifth wheel and a gooseneck trailer look much the same, their method for coupling is different. A fifth wheel uses a large horseshoe-shaped coupling device mounted a foot or more above the bed of the tow vehicle. A gooseneck couples to a standard 2 5⁄16-inch (59 mm) ball mounted on the bed of the tow vehicle. The operational difference between the two is the range of movement in the hitch. The gooseneck is very maneuverable and can tilt in all directions, while the fifth wheel is intended for level roads and limited tilt side to side. Gooseneck mounts are often used for agricultural and industrial trailers. Fifth-wheel mounts are often used for recreational trailers. Standard bumper-hitch trailers typically allow a 10% or 15% hitch load while a fifth wheel and gooseneck can handle 20% or 25% weight transfer. The basic function of a trailer jack is to lift the trailer to a height that allows the trailer to be hitched or unhitched to and from the towing vehicle. Trailer jacks are also used for leveling the trailer during storage. The most common types of trailer jacks are A-frame jacks, swivel jacks, and drop-leg jacks. Some trailers, such as horse trailers, have a built-in jack at the tongue for this purpose. Many older cars took the feeds for the trailer's lights directly from the towing vehicles rear light circuits. As bulb-check systems were introduced in the 1990s "by-pass relays" were introduced. These took a small signal from the rear lights to switch a relay which in turn powered the trailer's lights with its own power feed. Many towing electrical installations, including vehicle-specific kits incorporate some form of bypass relays. In the US, trailer lights usually have a shared light for brake and turn indicators. If such a trailer is to be connected to a car with separate lamps for turn indicator and brake a trailer light converter is needed. Nowadays some vehicles are being fitted with CANbus networks, and some of these use the CANbus to connect the tow bar electrics to various safety systems and controls. For vehicles that use the CANbus to activate towing-related safety systems, a wiring kit that can interact appropriately must be used. Without such a towbar wiring kit the vehicle cannot detect the presence of a trailer and can therefore not activate safety features such as trailer stability program which can electronically control a snaking trailer or caravan. By-pass systems are very cost effective but may not be appropriate on cars with interactive safety features. Larger trailers are usually fitted with brakes. These can be either electrically operated, air operated, or overrun brakes. Trailer stability can be defined as the tendency of a trailer to dissipate side-to-side motion. The initial motion may be caused by aerodynamic forces, such as from a cross wind or a passing vehicle. One common criterion for stability is the center of mass location with respect to the wheels, which can usually be detected by tongue weight. If the center of mass of the trailer is behind its wheels, therefore having a negative tongue weight, the trailer will likely be unstable. Another parameter which is less commonly a factor is the trailer moment of inertia. Even if the center of mass is forward of the wheels, a trailer with a long load, and thus large moment of inertia, may be unstable. Some vehicles are equipped with a Trailer Stability Program that may be able to compensate for improper loading. ^ "Gooseneck Trailer Hitch Information and Review | etrailer.com". www.etrailer.com. Retrieved 2017-07-22. ^ "Hitchesguide.com Is For Sale". www.hitchesguide.com. Retrieved 2017-07-22. ^ Carlos Perry. "Gooseneck vs 5th Wheel Hitch For Towing Fifth Wheel Trailer". OutdoorFact.com. ^ Karnopp, Dean (2004). Vehicle Stability. CRC Press. p. 93. Retrieved 2008-11-29. Wikimedia Commons has media related to Trailer.